BCM Power Supply Ground Circuit Inspection, door Lock Unlock Switch Check41, front Door Lock Assembly LH (Actuator) Check45, door Lock Actuator Check (Front RH Rear. Front Door Lock Assembly LH (Key Cylinder, passenger Select Unlock Relay Circuit Inspection, (SRS) "AIR BAG" and "SEAT BELT PRE-TENSIONER" 4, precaution Necessary for Steering Wheel Rotation After Battery Disconnect 4. Precaution for Procedure without Cowl Top Cover 5, sQUEAK AND RATTLE TROUBLE DIAGNOSIS 8, generic Squeak Rattle Troubleshooting 10, component Parts and Harness Connector Location 21. Wiring Diagram - D/LOCK - (Without Intelligent, wiring Diagram - D/LOCK - (With Intelligent Key) 32, terminal and Reference Value BCM 36, component Parts Harness Connector Location51. 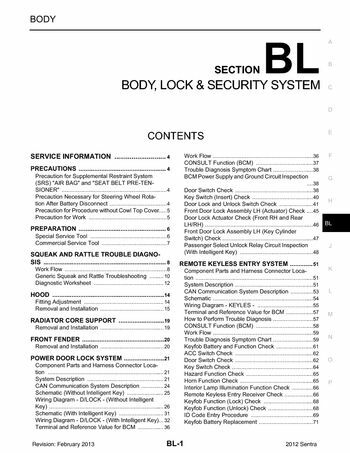 Terminal and Reference Value BCM57, removal and Installation Remote Keyless Entry, component Parts and Harness Connector Location 73, wiring Diagram - Intelligent Key - 86. Intelligent Key Unit Harness Connector Terminal, terminal and Reference Value Intelligent Key, steering Lock Solenoid Harness Connector Terminal Layout 96, terminal and Reference Value Steering Lock. Terminal and Reference Value BCM 96, terminal and Reference Value IPDM E/R 96, terminal and Reference Value Combination, power Supply Ground Circuit Inspection108. Key Switch (Intelligent Key Unit Input) Check109, front Door Lock Assembly LH (Door Unlock Sensor) Check119, check Intelligent Key Warning Buzzer (Front, cVT Shift Selector (Park Position Switch) Check 127. Removal and Installation Intelligent Key Unit131, component Parts and Harness Connector Location 146, wiring Diagram - TLID - 147, terminal and Reference Value BCM 148. Trouble Diagnosis Chart by Symptom 149, terminal and Reference Value BCM 150, intelligent Key Unit Power Supply and Ground Circuit Inspection 150, check Trunk Opener Request Switch Circuit (With. Check Trunk Lid Opener Actuator Circuit 152, component Parts and Harness Connector Location 155, wiring Diagram - VEHSEC - 159, terminal and Reference Value BCM 162. Component Parts and Harness Connector Location 172, wiring Diagram - NATS - 174, terminal and Reference Value BCM 174, how to Replace NATS Antenna Amp 184. Precaution in Repairing High Strength Steel 210, precaution for Supplemental Restraint System (SRS) "AIR BAG" "SEAT BELT, the Supplemental Restraint System such as AIR BAG” and SEAT BELT PRE-TENSIONER”, used along, with a front seat belt, helps to reduce the risk or severity of injury to the driver and front passenger certain. System uses the seat belt switches to determine the front air bag deployment, and may only deploy one front, air bag, depending on the severity of a collision and whether the front occupants belted unbelted, information necessary to service the system safely is included in the SRS and SB section Service Manual.